LEGATO 120 is the a recent addition to our arsenal of mood support. In musical terms the Italian word 'legato' means tied together, indicating that musical notes are played or sung smoothly and connected. Smooth and connected is exactly how you will feel when taking LEGATO. 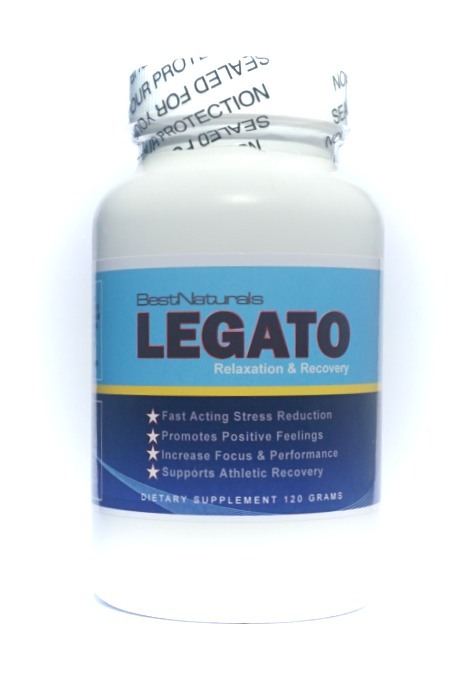 LEGATO is a fast acting stress reducing formula that helps normalize brain energy metabolism changes caused by stress. It also promotes positive feelings helping you stay focused, smoothed and connected to life. Just like all our other products LEGATO is all natural, completely safe and non-addictive. It is highly effective in the creation of relaxing Alpha brain waves, controlling homocysteine levels, and optimizing serotonin and dopamine transmitters. Enjoy! LEGATO 120 is one of our most potent stress-busting formula. Read the label, follow instructions and use responsibly. We suggest you start out with a mild or moderate dose first. That means about 1/2 to 3/4 teaspoon of powder. Mix with your flavored beverage for better taste. Results are typically felt in under 30 minutes. If after 25-30 minutes you do not feel the results you desire, just take another 1/4 teaspoon of powder every 25-30 minutes until the desired effects are felt. Many of our customers use our mood support products to relax, recover, stay focused and sleep better. With one dose I experience a lift in mood and a feeling of relaxation. Great product. I recommend it!